In light of lower than expected domestic economic growth and brewing international uncertainty, Finance Minister Bill Morneau’s second budget is best described as Phase Two. Infrastructure development has been a key element of the government’s economic plan and Budget 2017 continues to emphasize its importance to innovation, community building, job creation and economic growth, and offers more information about the Canada Infrastructure Bank (CIB), including some details about how it is expected to invest its $35 billion in funds over the next 11 years. Announced in the 2016 Fall Economic Statement, the CIB is intended to work with the private sector to fund large, transformative projects through loans, loan guarantees and equity investments. While there are no new details about how the government intends to attract private-sector dollars, the budget indicates the government intends to formally establish the CIB and have it operational before the end of 2017, a timeline that will require enabling legislation to be introduced in the coming months. There are no new details on bank governance or structure, but the budget does provide some clarity on general areas of investment, including public transit, green infrastructure projects, and trade and transportation priorities. The CIB will be used as a tool for gathering information and data on the state of municipal and provincial infrastructure. Phase One of the government’s infrastructure spending plan included a focus on modernizing public transit across Canada, and Budget 2017 specifies it will provide $20.1 billion of transit funding over 11 years through bilateral agreements with provinces and territories. Funding allocations for each jurisdiction will be based on a formula that considers ridership (70 per cent) and population (30 per cent). The budget commitments on transportation are framed in the context of infrastructure development that supports trade, consistent with the $10.1 billion that was dedicated to trade and transportation projects in the Fall Economic Statement. However, while announcing these new investments, the government also intends to eliminate the public transit tax credit because it has not resulted in increased ridership that would reduce greenhouse gas emissions. Launch a $50-million Trade and Transportation Information System. After consulting broadly in 2016 on housing needs across Canada, Budget 2017 introduces $21.9 billion in social infrastructure funding over the next 11 years, including $11.2 billion for a National Housing Strategy, with $5 billion dedicated to a new National Housing Fund. Budget 2017 articulates affordable housing as a pressing concern and priority, establishing a Federal-Provincial-Territorial Partnership that will seek to address unique housing needs across the country. Budget 2016 laid out an ambitious, expensive plan to help the middle class and grow the economy. 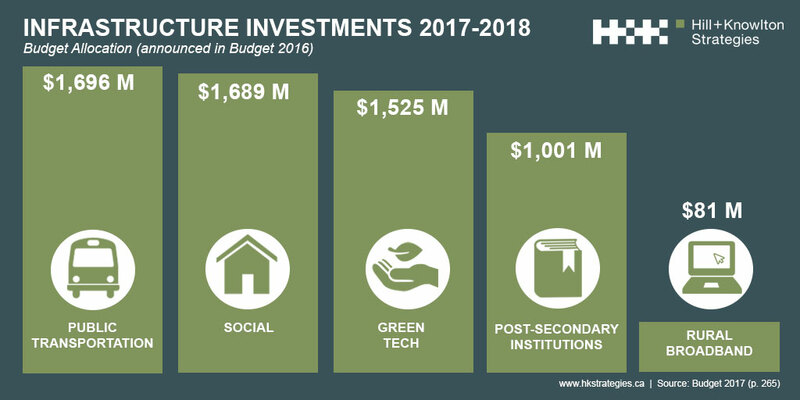 The major funding pieces announced then – infrastructure, innovation and skills training – were multi-billion-dollar, multi-year funding initiatives that are staying the course through 2017. There was no need to announce new spending in Budget 2017, given that it was all announced last year (and even more convenient because there is no new money to spend). This is good news for stakeholders who have already aligned with government priorities and are looking for details on how to move forward on these initiatives. H+K’s Cities+Infrastructure is an integrated communications service offering tailored to the needs of proponents invested in city and infrastructure development. We help anticipate and manage critical social and political risks by meaningfully engaging governments and citizens throughout the project’s life cycle. Services include government relations, corporate communications, issues and crisis management, corporate community relations, digital and in-person engagement, research and content development.